Potty training doesn’t always happen in a matter of days. Gradual potty training can be a less stressful and effective method for your child. The three-day potty training method doesn’t work for every child. Parents still give it a try, especially with how well it seems to work for everyone else. But those three days can come and go with children still in diapers. Potty training, like many milestones, makes us wonder whether our kids will ever get it. But, like my kids’ pediatrician told us, you won’t see kindergarteners in diapers. It will happen. Still, that doesn’t make it easier when we expect our kids to be potty trained in three days and they aren’t. I potty trained my eldest in three days, but I didn’t do the same with my twins. In fact, I don’t think I ever “started” potty training them. The learning process was such a slow approach I knew I had to share it with other parents who wanted something similar. Read more about how to potty train twins. With gradual potty training, the “start” and “end” dates are a blur. You won’t have an official potty training day, and you won’t feel like your child has mastered it 100% by a certain time. Instead, it starts early with preparing for potty training. You’ll do things like let your child sit on the potty fully-clothed, and read books about the potty. Take a look at several potty training books for toddlers. Seems simple, right? Your child will better understand how to use the potty when he doesn’t have the crutch of his diapers. At home, put him in undies and explain he’ll pee in the potty, not his undies. Show examples of older siblings doing the same, and that he can have a chance to try it himself. Potty training doesn’t need fancy equipment. But you do need the items that work for your child. You’ll also need to come equipped with items to make potty training easier for everyone. 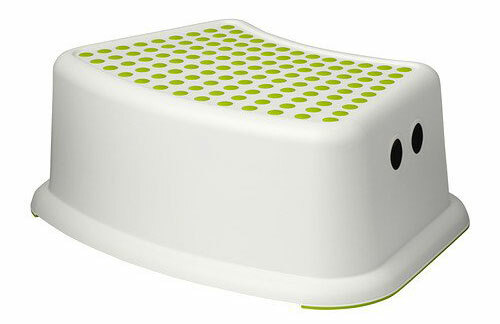 Your child won’t be able to sit on it as easily and it might feel daunting to him. But it’s much easier to clean and transitions well to a regular potty. This seat will also need a bathroom step so he can climb on and off. At many preschools including my twins’, teachers will set aside a time to use the potty. The kids line up at regular times of the day, whether they asked to use the potty or not. This makes it much easier on teachers who have several students to care for. But it’s also a useful practice even at home. Start with mornings and evenings. Take your child to the potty right after waking up. Then try again before bath time and pajamas. I also like to take my kids before we leave the house. 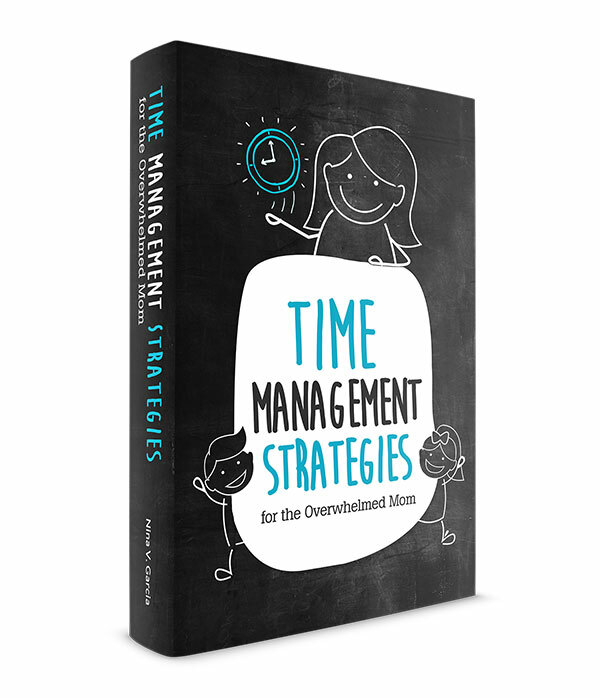 Set regular times throughout the day to take your child to the potty. Then, you’ll notice patterns with your child and find optimal times to take him. For instance, one of my twins will almost always poop a few minutes after breakfast. He’s so consistent, I now take him to the potty at 7:45am every morning. 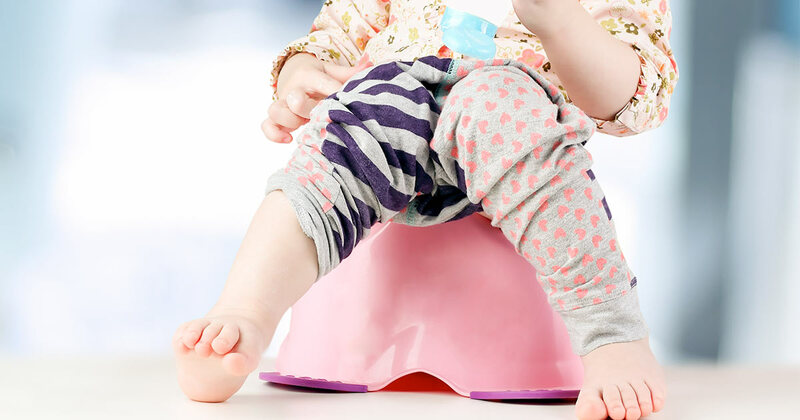 Read more tips on how to get your toddler to poop in the potty. Remember when your child was a baby and you looked for sleep cues? Though hit or miss, they helped you decide when he was sleepy or not. Cues also work when you potty train gradually. Look for signs that show your child needs to use the potty. Maybe that’s him running to the corner for privacy because he feels the urge to poop. Or his face looks anxious and he tiptoes back to his room. Maybe it’s when he’s hopping around doing your typical pee-pee dance. These cues reveal opportunities to take him to the potty. They also show your child what he can do should he feel these signs again. I’m one of those few parents who don’t use rewards during potty training. Praise, yes, but don’t use toys, stickers or other privileges as a means to get your child to use the potty. Rewards don’t work in the long run and establish bad habits. Instead, celebrate every effort and success, no matter how small. Your child will see that using the potty is a challenge he can overcome. He’ll feel proud of his accomplishments and use that as his internal motivation to keep going—not the stickers hanging on the wall. Learn why rewards don’t always work. Done correctly, praise shows your child the result you want to happen. Obvious reasons to praise include peeing and pooping in the potty. But you’ll also want to praise your child for other less obvious achievements. Let’s say your child told you he had to pee. You both ran to the potty, except not fast enough: he peed all over his undies instead. Your first reaction might be to lecture, or perhaps show disappointment he didn’t pee in the potty. Instead, praise him for telling you he had to pee. After all, isn’t that an accomplishment in itself? Learn how to praise the right way. Your child will have accidents. You won’t be able to avoid it. He might leave a heavy puddle of pee on the couch. He might poop at the park and you’re forced to change him in the van and throw his soiled clothes away. He might even have an accident right after you asked him if he needs to use the potty. The examples above? They’ve all happened with my kids. Get comfortable with accidents. Don’t think of them as failures on either your or your child’s part. They’re inevitable and happens to the brightest kids and most organized moms. Expecting accidents reminds you not give him grief when they happen. It also welcomes more opportunity for your child to wear undies when you’re not afraid of potential accidents. If at any time your child feels upset about the process, postpone it for a week. Potty training should not feel like punishment. He might feel anxious or cautious, but he should also look forward to it. If at any time he cries or you feel like you’re forcing him, stop. Wait a week, then try again. This isn’t about you. Deadlines or expectations of when your child should be potty trained add to the pressure. Instead, accept your child’s timeline. Feeling stressed can translate to a power struggle between you two. And when that happens, he’ll feel less inclined to use the potty when he knows it’s such a hot topic. The thing holding him back wouldn’t even be his own developmental stages. It’d be how potty training has become a contested issue. Instead, relax. Distance yourself from potty training and don’t take it personally. It’s not something to argue about. The more carefree and encouraging you can be, the more inclined he’ll be to give it a shot. See how being carefree can help change your day. I’ve potty trained both ways: over the weekend and over several months. The result? All three kids now use the potty. 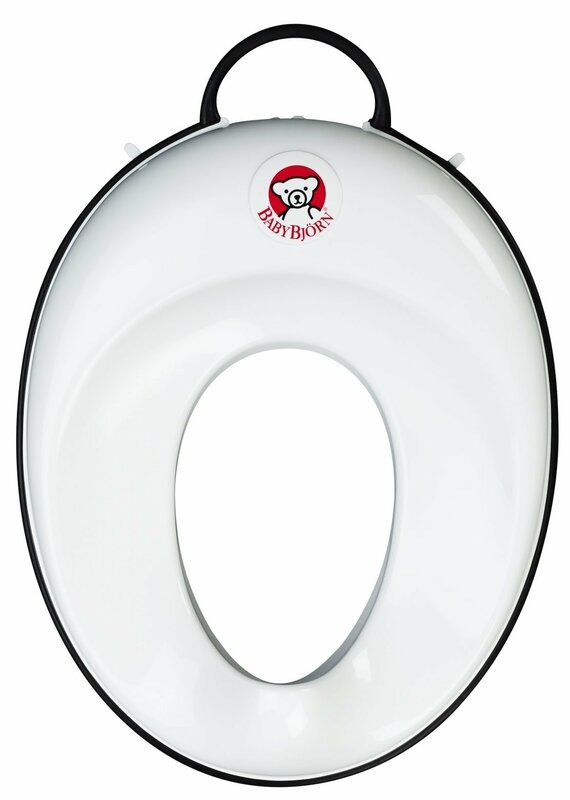 Set aside any pressure to potty train within a given time frame. You don’t have to follow a quick path to potty training if it doesn’t feel comfortable or it doesn’t work for you. You’re not doomed because your child still isn’t potty trained after a weekend. Even the three-day potty system still includes accidents down the line. But with gradual potty training, you base the process on your child’s timeline, not yours. Your child will learn how to use the potty, even if it takes a little longer. You won’t be packing diapers in his kindergarten bag, after all. Tell me in the comments: Did you do gradual potty training or within a short period of time? 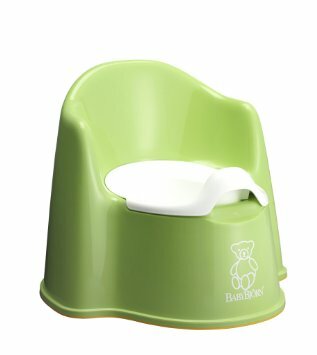 What are your best tips for potty training slowly? Thank you for this article. I tried the 3 day method with my daughter (who was “ready” according to all the articles and books I read) but after three days we were both left frustrated and my daughter was no closer to being potty trained!! I think this method will work much better for her (and me!). Thank you!!! Des is pretty timely too! Every morning after breakfast. We did the three day method with Scarlet and it was pretty powerful, but even with doing that, I still found it to be a gradual process. I think spreading it out more helped a lot with Des. We have similar stories, Tamara! Yes, the three-day process is still a gradual one in the end, what with all the accidents. I don’t think my eldest truly mastered pooping until a full year after we started. The twins however are already pretty good about avoiding accidents for the most part. It’s so refreshing to be done with diapers! I’m almost there. We still have nighttime diapers for naps and bedtime, but otherwise we haven’t put regular diapers on in forever! Wow, one day is amazing Pamela! And yes, goes to show how different potty training can be between your two kids. Same household, but definitely different paths. We’re in the thick of it! I’m not big on rewards either, but my little guy goes to a morning program once or twice a week and they give smarties for successful potties. I’ve kept with that to keep it consistent. Can’t beat those Smarties! I loved that as a kid (or maybe I still do 🙂 ). Oh, potty training. We didn’t try any ‘method’ with our oldest. She basically had to be out of diapers and pull-ups by age four because of school. But since we had strong support at her school, it just kind of worked itself out. With L, we succumbed to pressure from my parents to potty train her in 3 days before she was ready. I really don’t recommend it. All looked good for a while, but when she regressed, it was really bad and became a total power struggle. It took spending a week with strong pressure from her aunt and cousins to finally give up the power struggle. (fingers crossed). I definitely think that a gradual process is the way to go! It’s amazing what a good school support system can do. And yes, the problem with forcing a timeline on kids is the ensuing power struggles. I think the fast method is worth a try because it can work for some kids like it did with my eldest. But parents also need to relax if it doesn’t end up working out, too. We can always try again later! I know what you mean, Karen. There’s definitely a pressure, with any milestone, for kids to meet it at a certain time frame that sometimes we rush kids before they’re ready. I do admit the three-day method worked for our eldest, but our twins took to a much more gradual approach. This is such good advice. I am currently taking a very relaxed approach with my 23-month-old. It is so encouraging to see her getting more aware of needing to use the potty each week. Awesome, Sharla! It’s definitely refreshing to be able to go at the pace your child needs. I’m having the toughest time with our three year old daughter. I can’t tell if she just doesn’t get it or refuses to. She knows how to use the potty and uses it several times a day, but we’re still having 2 to 5 “accidents ” a day for two weeks now. There’s no bribe that’s worth it to her to be consistent. It’s constantly a battle of wills. I feels like she will be that kid in diapers at graduation. Rest assured Nina, she won’t be in diapers at graduation 🙂 In fact, my kids’ pediatrician reassured us not to worry about potty training, and that kids don’t enter kindergarten in diapers. Meaning, it’ll all work out eventually, even if it doesn’t seem like it right now. I would actually try to not bribe or reward her with things, as those fizzle out after a while, and she’ll only feel motivated by external sources rather than her own internal sense of joy and pride. Follow her lead, and try not to make a big deal about it (even though I know how frustrating it is to deal with accidents!). I find that letting it go, and showing that it doesn’t affect you, keeps the peace and makes her less resistant (and you more patient) in the process.